Who would have thought that the picturesque Baltic island of Gotland could be the scene of so many brutal murders? 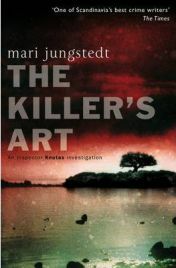 The Killer’s Art is the fourth instalment of Mari Jungstedt’s Inspector Knutas series set on the Swedish island and it opens with one of the most shocking murders yet. Previously Jungstedt has set her stories in rural Gotland, but now she moves to the main town, the historic port of Visby for her main crime scene. Early one Sunday morning in the heart of winter, a hotel worker on her way to start an early shift makes a gruesome discovery: she finds the body of well known local art dealer Egon Wallin hanging from one of the towers of Visby’s ancient city walls. In the early days of the investigation Inspector Knutas and his team learn that Wallin had been killed the day before he embarked on a new life: they find evidence that Wallin had sold his gallery and was about to present his wife with divorce papers. Enquiries carried out locally indicate that while Wallin may possibly have been having an affair with a man, his wife was certainly in a relationship with a male neighbour. Some paintings found in Wallin’s house turn out to be some important pieces stolen in a series of robberies and then a piece of art is reported missing from the debut exhibition of a radical eastern European artist being shown in Wallin’s studio. Should Knutas look at the possibility of a murderous lover or is the death connected with the art world? Soon after, Stockholm’s Waldemarsudde Museum is the scene of a daring crime; a thief has climbed in through a skylight and stolen “The Dying Dandy”, one of the most famous works of art in Scandinavia, a painting which is reputed to depict a well known aristocrat who led a debauched lifestyle and was allegedly homosexual. In front of the now empty frame, the thief has left behind another work of art, one that has a connection with Gotland. As the investigation progresses, Knutas, liaising with colleagues from the mainland, learns that beneath the charming exterior of Sweden’s art world, there lurk more secrets than he might ever have believed. As in the previous novels in the series, Stockholm-based television journalist Johan Berg is soon on the scene looking for a scoop. This time it’s even more important for Berg to get some recognition because he’s hoping that he can convince his bosses to re-open the Gotland newsroom; this is the only way he can think of to be able to move to Gotland and be with his girlfriend, Emma, and their baby daughter. This time Johan’s story focuses much more on his personal life although he still contributes to the investigation. The way Jungstedt fuses the two investigations – the official police enquiry and, running parallel to it the journalist’s determined attempts to get a good story – works brilliantly and is one of the features that really stands out in the Gotland novels. The relationship between Knutas and Berg is an interesting one and the detective tolerates Berg with a degree of respect; as a result Berg is willing to share anything he learns with the police and, in return, Knutas is perhaps more open with Berg than he might be with other journalists. After number four in the series I’m glad I gave Mari Jungstedt another chance. When I reviewed the first in the series, “Unseen” I was not sure that the character of Knutas was strong enough, but my opinion has changed. He’s quite a complex character, prone to brood at times, but he comes with a lot less baggage than other heroes of Scandinavian crime fiction. I had originally persuaded to read the first book because of an interest in the location but I was disappointed that it didn’t have as much of an impact on the story that I’d hoped; four episodes in I’m much more content with the settings and I feel they are an integral part of the novels. Jungstedt, a former journalist herself, does murder brilliantly and carries on the fine tradition of Scandinavian crime writers. The Killer’s Art takes place in the depths of winter and you can almost feel the chill coming from the pages. One section of the story that takes place on a cold night in Stockholm is superbly tense and sinister. But Jungstedt’s excursion into the art world is an interesting departure and offers a new perspective on Swedish culture without becoming too scholarly; I found the historical background of “The Dying Dandy” enthralling and it wasn’t until I finished the book that I learned that The Killer’s Art refers to real painters and paintings – I always like to learn something and be entertained at the same time. The recurring character now seem well known to me and there’s something comfortable yet exciting about picking up the latest Mari Jungstedt; the back stories of these characters are developing nicely but Jungstedt wisely limits the personal elements of the story each time so that the crime is the central part of the novel. This time she has written perhaps the most intricate mystery yet and appears to have woven an over ambitious story because there are several significant loose ends that aren’t tidied up by the end. Hanging a man from the city walls is a very public way to murder someone and certainly gives the impression that the killer wanted everyone to know about the killing; however, the significance of the tower is not revealed, nor is it explained how the killer managed to haul the body to that incredible position. Jungstedt provides plenty of clues along the way but it’s the red herrings and sudden twists that make this such a good read. The writing is uncomplicated and stylish and Mari Jungstedt knows how to keep her readers gripped. She is fast becoming the queen of contemporary Swedish crime writing and her books are required reading. One Comment on "The Killer’s Art"
I think some of the best series are cumulative in effect, the first one might not seem great but further on you find you’re hooked.